A high wind blows across Katoomba on the morning of my visit to Sculpture at Scenic World, whipping tourists’ hair into haystacks at the cliff-top entrance. Five hundred and forty-two metres below, however, in the pocket of Jurassic rainforest where this annual exhibition is installed, all is sheltered. 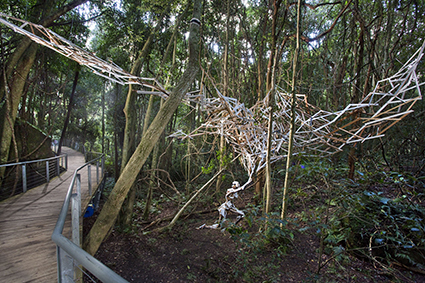 There are three ways you can reach Sculpture at Scenic World: either by the celebrated near-vertical Scenic Railway, by cable car, or on foot along one of the Jamison Valley’s public walking trails. On this occasion, the cable car provides a vertiginous, spectacular descent. On the way down, Fransesca Mataraga’s 2240cm-long striped banner can be seen twisting in the wind between the twin, very straight and supremely tall eucalypts to which it’s attached (installation carried out by a courageous arborist). This year’s judges, curator Anne Loxley, Blue Mountains sculptor Clara Hali and Emeritus Professor David Williams, have selected 31 artists for the exhibition, now in its fourth year (and the first for Exhibition Manager Justin Morrissey, taking over from Lizzy Marshall). While last year’s selection explored the relationship between the machine-made, the hand-made and the natural, as well as more straightforward modernist and/or playful installations, this year’s emphasis is on organic, enigmatic works that seek to mimic their environment to create a camouflage effect that, while posing challenges for photographers, makes us alive to the forest’s intricacies. Greer Taylor’s Reciprocity, for example, reveals itself as a mass of suspended twigs and slim black rods, meticulously designed to be elevated as a body. The result is of a harmonious increase in the density and detail of the landscape: a shimmering spatial dialogue between artwork and forest. Deborah Redwood’s brightly coloured Sacred Vines snake along the forest floor in imitation of the natural vines that proliferate here. The delight the eye takes in tracking these sinuous forms is perhaps at odds with the work’s intent; by placing her artificial, non-functional vines (made of discarded consumer materials) alongside real ones, which are innately non-wasteful, Redwood is commenting on human waste and excess. An environmental message is also implicit in Michael Shiell’s Fools Vessels: Balance, a delicate wire canoe that appears to float in the air, strategically suspended by two counterweights. Shiell used wire from farm fences in western Victoria that had been destroyed in a once-in-200-year flood event on the Wimmera River in 2011. The work’s allegorical title, source of materials and precarious equilibrium all express concerns about climate change. Installations by Stevie Fieldsend and Marcus Tatton intimately engage with this particular place. With Mysterious Threshold, Tatton places several upright bundles of twigs, coloured in parts, at intervals on the forest floor. Emerging subtly from the landscape, they intrigue with their suggestion of unknown rituals. Fieldsend’s Bulging Ichorous magnifies the forest’s small wonders through a group of carved black wooden stumps that look as if they belong here, each topped with an enticing glass globule suggestive of sap or dew. The very title of Somchai Charoen’s Landmind suggests a sinister examination of the landscape. The artist’s pastel flowers dot the forest floor, their prettiness belying the deadly mechanism represented beneath. They create in the viewer a distinct sense of virtual unease, forcing contemplation of a very real global evil. Lang Ea’s disembodied heads litter the landscape in a similarly disquieting way, also symbolising the aftermath of war. Bringing a less grim sense of human perspective to the landscape, Motoko Katsuta Kitano’s Dream/Yume is heard before it is seen as the strains of Twinkle, Twinkle, Little Star play through the forest. Around the corner, the atmosphere of surreal lullaby is realised in the form of a child’s cot through which a tree grows. Further up the slope are two double beds, one covered in moss, the other made of mirrors. Hiding in plain sight, they are the stuff of mysterious fairytale, suggesting a humanity reclaimed by nature. Continuing the domestic theme, Sandra Nyberg’s Heritage is a timber house frame, an elegant drawing in space that refers to both Hill End miners’ huts and modernist Scandinavian design. Echoing the actual reconstructed miner’s hut the viewer passes on the boardwalk, it also serves as a ghostly reminder of the region’s coal-mining history. With a great sense of sweeping motion, Elyssa Sykes-Smith’s modernist assemblage of angular timber pieces, A Canopy of Thoughts, shows a lunging female figure whose upraised arms join and transmogrify into a spreading cloud of timber bars above, which in turn merges with the forest. The winner of this year’s competition, it’s a technically accomplished, rather heroic piece. In common with many sensitive works in this exhibition, its synthesis into its environment is such that it might almost have emanated from the forest itself.